How does the Squeeze Page Toolkit work with FLG360? 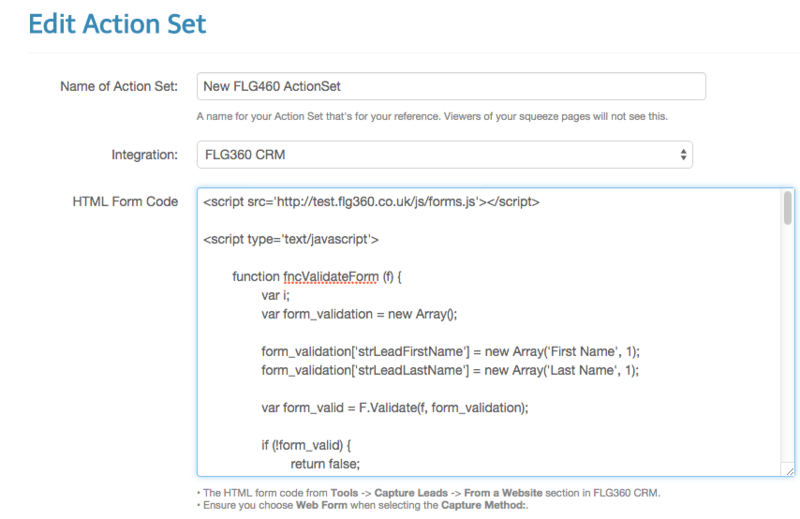 Unfortunately there’s no automatic way to fetch your forms from FLG360, as you need to manually copy and paste your web form into an ActionSet from FLG360. You’ll also need to modify the code from FLG360 a little to get the capture form that you’d like. If the way that FLG360 works changes, we’ll update the toolkit and this documentation accordingly. a) In the Squeeze Page Toolkit menu, click on the menu ‘Setup‘ -> ‘Integrations‘. b) Then click on ‘Edit Settings‘ next to the FLG360 Integration details. c) Then enable the integration by clicking on ‘Enable‘ in the dropdown box for FLG360. Then click on the ‘Save Details‘ button. 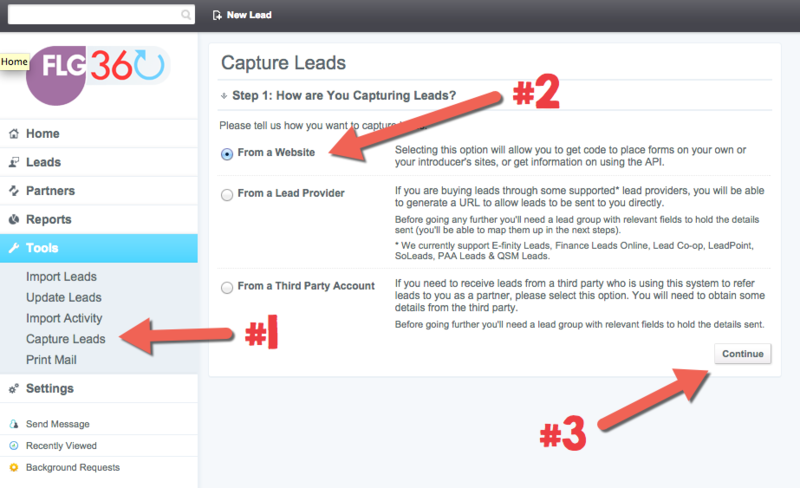 a) Go into your FLG360 CRM account, and click on ‘Tools‘ -> ‘Capture Leads‘. Then ensure the ‘From a Website‘ option is selected, then click ‘Continue‘. 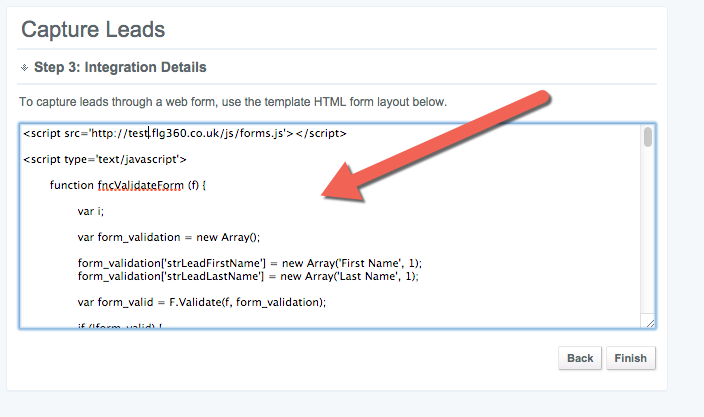 b) Ensure that on Step 2, that your Capture Method is set to ‘Web Form‘ (this is VERY important). 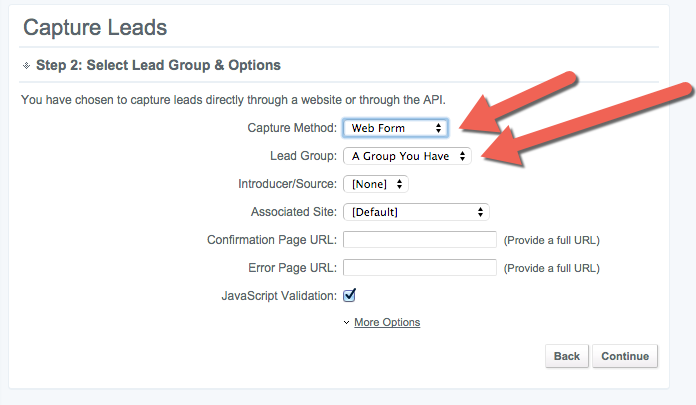 You can optionally choose your Lead Group if you wish too, which will just be a group you’ve created within FLG360. Then click on the ‘Continue‘ button. 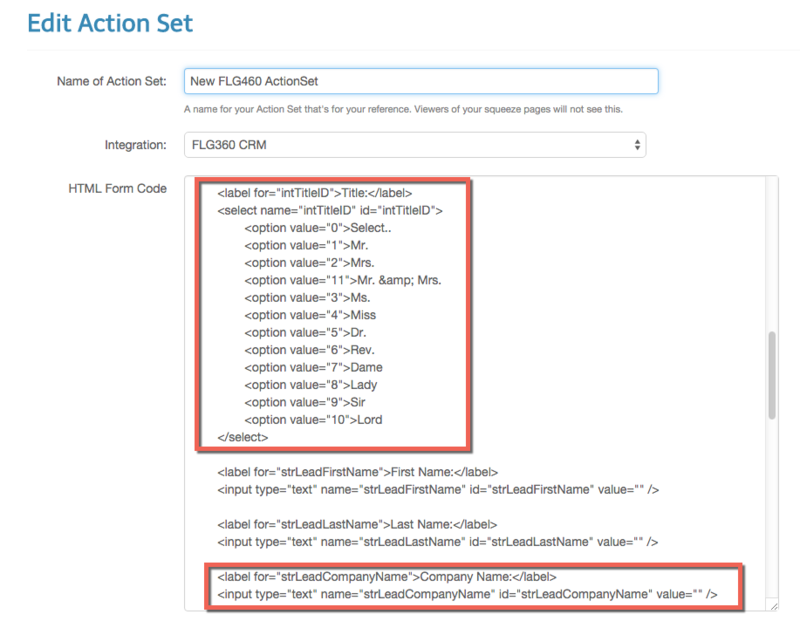 b) Paste in the code you copied from FLG360 CRM for your form (Ctrl-V). c) Modify the code to REMOVE the fields that you don’t want. This is because FLG360 gives you every field that they have, and you have to manually remove the code for fields you don’t need. Usually you’ll just keep name and email address fields. For example, the code in red boxes below could be removed if you wanted to remove Title and Company Name from your squeeze page (which would be a sensible thing to do). If in doubt, just send us a support message, and we’ll help you modify the code. d) Then click ‘ Save Details‘. Then you can access this ActionSet in any of your new squeeze pages.